Brilliant analysis Tony Heller aka Steve Goddard. And, not to mention that a homeless encampment cooking fire was responsible for the latest Bel Air fire. 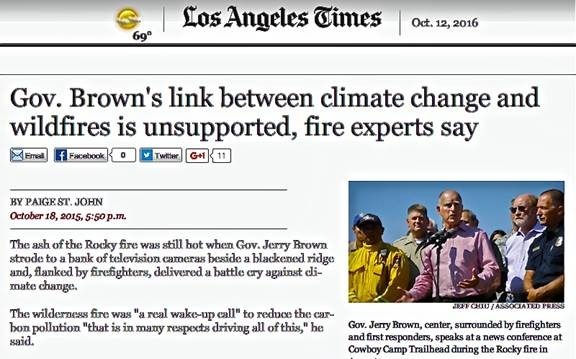 Yet, California’s “climate ambulance chaser” in chief, governor Jerry Brown instead blamed “climate change” as a “new normal” … apparently an easier problem to address than the state’s chronic homelessness. In this video, author and scientist Tony Heller brilliantly debunks ambulance chasing climate scientists who come out of the woodwork every time there is a natural disaster, like wildfires in California. In fact, burn acreage in the US has plummeted over the past 85 years, as CO2 has increased. With 13 known fatalities and nearly a thousand buildings and structures destroyed in the tragic Tennessee fires, the usual climate ambulance chasers are out in force blaming, you guessed it, man-made “climate change”! Climate change is measured over multi-decadal periods, over a 30 year period or ‘climate point’, not over “many weeks” as the Guardian ferments. But, how severe is this drought historically? And, is it due to human CO2 ‘carbon’ emissions or simply, natural cycles in climate? Before WW2, the time period that the IPCC claims CO2-emissions were yet to have an effect on climate, the US experienced more severe drought. The most glaring example of the hysterical Guardian’s dishonesty to its readership, is the simple fact that while CO2 has been increasing, the “Numbers of [Tennessee] wildfires have been trending downward since the late 1970’s.” ! This is why “fake news” organisations like The Guardian, CNN, ABC, The Age, The Sydney Morning Herald, NYTimes, Washington Post, BBC et al., cannot be trusted on anything related to global warming climate change. They are not interested in “the science” that they and fellow climate alarmists claim to own, rather, their primary interest lies in misinforming readers and viewers with cherry-picked propaganda to further their political goals and ideological agenda. And to dear John Abraham, “belief” and “denial” are the words of zealots, not scientists. Those who continue to slime with the “denier” meme, in a vile reference to “Holocaust denial” (designed to intimidate and isolate) indicate they’ve run out of arguments, and slurs are all they have left. The historical climate data above, that took 10 minutes to source, exposes this. Climatism extends its condolonces to the victims and their families and all those effected by the Tennessee wildfires. And blessings to the brave first responders. As evidence for anthropogenic global warming theory dwindles, with widespread debunking of the favoured canaries of doom (like the recent record September Arctic sea-ice growth along with its decadal recovery) the CAGW obsessed mainstream media will simply double down on their falsehoods to reinforce their ideologically driven agenda. They certainly won’t re-evaluate or tell truths about “global warming”, as too many jobs, money and reputations are now at stake. 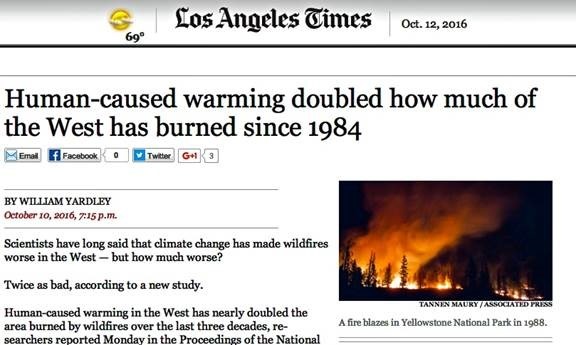 The October 10, 2016 Times article addresses a study recently published in the Proceedings of the National Academy of Sciences where the authors claimed that through the use of large scale climate models and annual wildfire data from 1984 to 2015 they determined that man made climate change increased the aridity of wildfire fuel by 55% which doubled the area of the western U.S. that burned during this period.